Fishing in Seadrift | Sweet . Sassy . and a bit Smart-Assy . 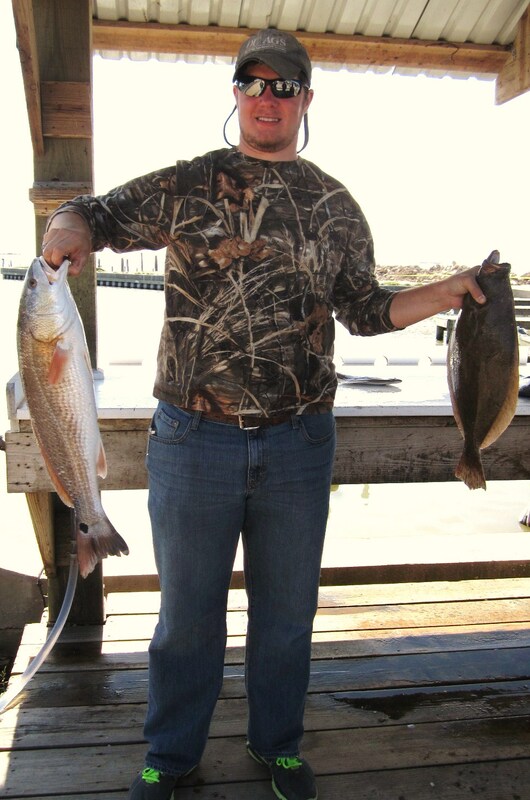 This past weekend Joseph and I joined my parents on a little saltwater fishing trip. 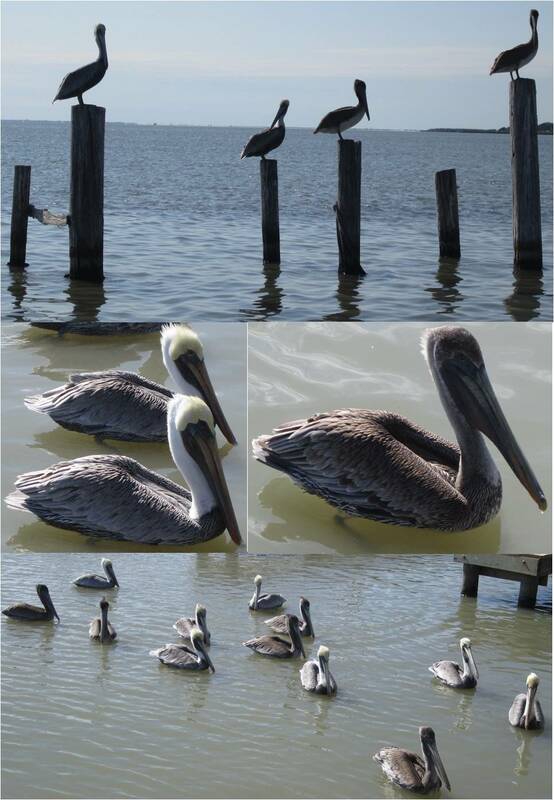 We drove down to Seadrift, Texas Friday evening, fished Saturday and Sunday, then drove home Sunday afternoon. This didn’t exactly get me excited about staying here. I already have a fear of hotel/motel comforters so every time I stay at one, the comforter gets thrown in a corner using my foot and I just use the sheets. Fun Fact for you: In your typical hotel, the sheets are changed and washed everyday. The comforters are only cleaned if there are visible stains…sick. So obviously I bring my own comforter (and usually pillows). When we arrived, the place looked just like the pictures but I was surprised by how clean the place actually was. Everything was old but very clean. I still removed the comforter but I didn’t feel disgusting walking around in this place. 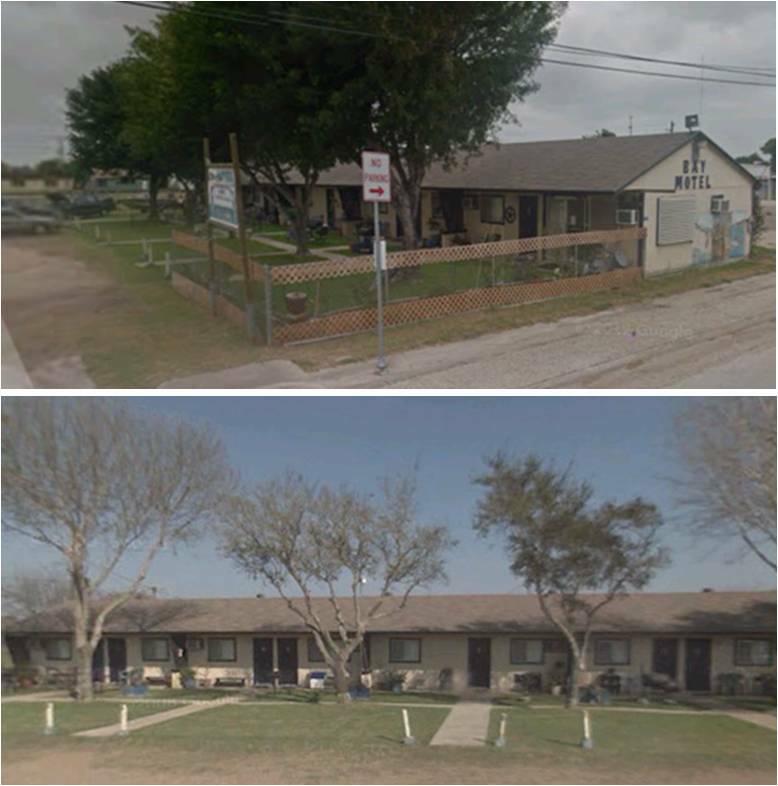 It is definitely a place for fishermen because it is so close to the boat ramp and has a kitchenette area for cooking and even a place to clean your fish. The man who owns this place, Herbert, was SO nice. Herbert told my dad good spots to fish and he even played washers with Joseph, my dad, and me for a while. He went out of his way to make sure we had a great stay at his motel. It made me feel a little better about the place after meeting Herbert. He wasn’t shady or creepy so it was a little more comforting. I would stay there again the next time we are fishing down there just because of the hospitality. As you all are probably aware by now, cold weather rolled through Friday. When we woke up Saturday it was about 55 degrees and the winds were blowing at 15mph. Great day for being on a boat…good thing I brought my gloves, ear-warmers, thermals and ski jacket! I definitely needed all of them! After we started catching fish, the adrenaline warmed us up though! 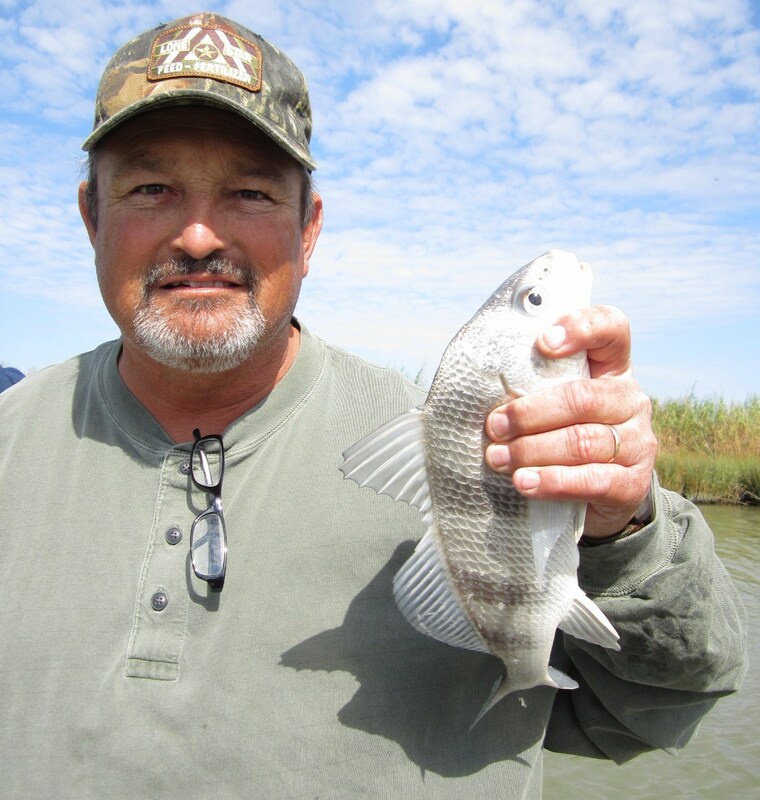 Going into this trip, Joseph had never caught a keeper red fish. 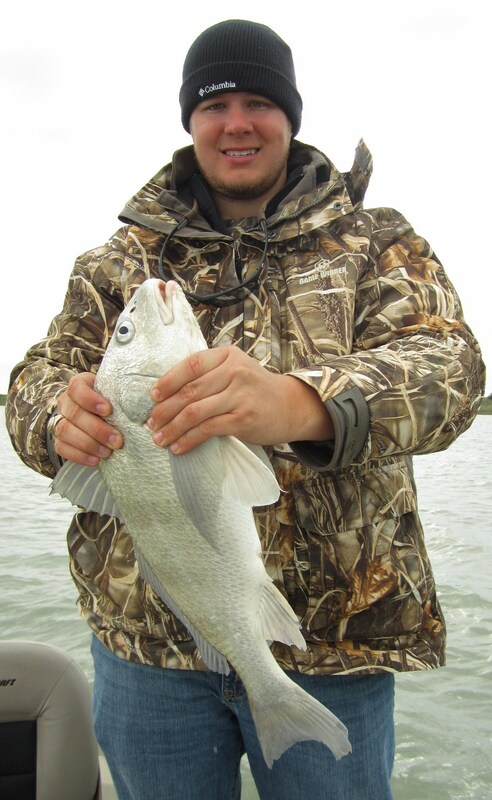 He had caught several that were almost there, like an inch or even half an inch too short. So our goal this weekend was to get him to catch a keeper red. He caught a couple little ones that were just a few inches too short before he landed his keeper! This baby was 26 inches! They only have to be 20″ to keep and my biggest one to date is 24″. I don’t know who was more excited: Joseph or my dad. My dad is one of those people who knows a lot about fishing and enjoys fishing but loves seeing us catch big fish. Dad likes to see the excitement we have when we first hook it and are trying to explain to him what we think we caught before we see it. It makes it a lot more fun for us seeing him so excited. That’s one main reason why I like fishing with my dad…other than me being partial because he’s my dad…not to mention the fact that he can usually put us on fish better than the guide we used before. 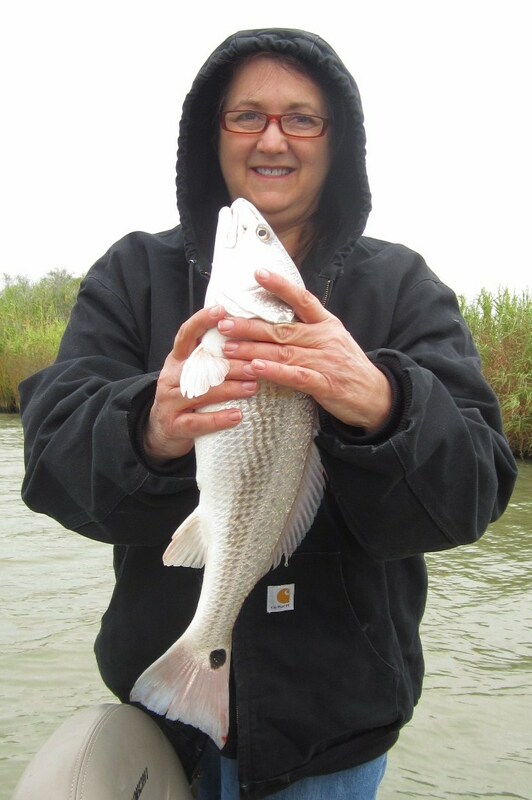 Mom caught a 19.5″ red, along with a bunch of other reds that were just barely too small to keep. I had a pretty slow morning, catching only about 2 baby reds but by the afternoon it started picking up a little more for me. 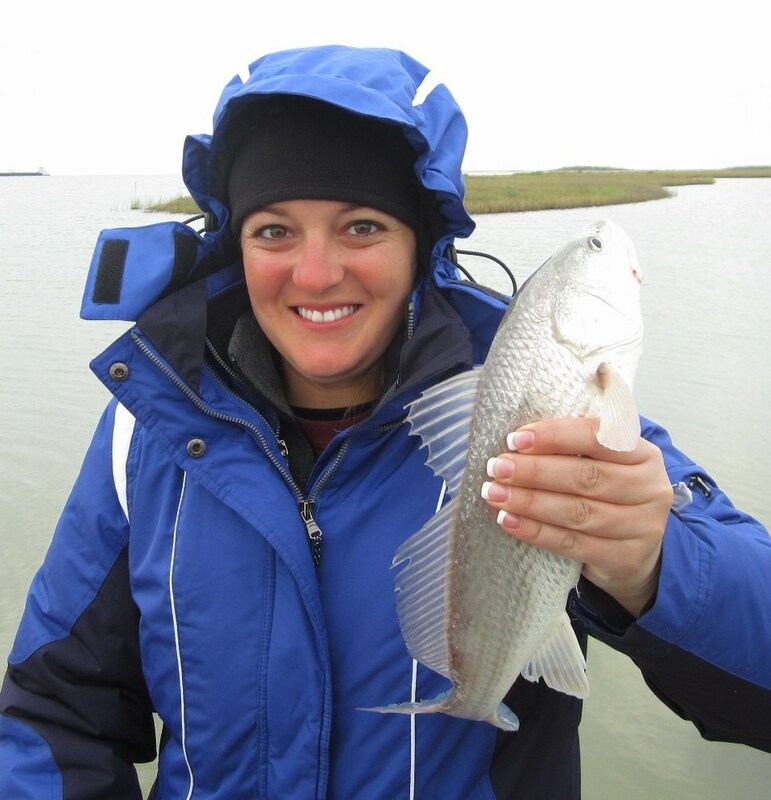 I caught a few baby reds but I mostly caught crap-fish…small black drum and sheep-heads. These tend to steal your bait multiple times before you actually reel one in, only to be annoyed that you have to take it off your hook and throw it back to repeat the process. They are called sheep-heads because their teeth look like those of a sheep, as you can see in the picture above on the left. It’s actually quite creepy. 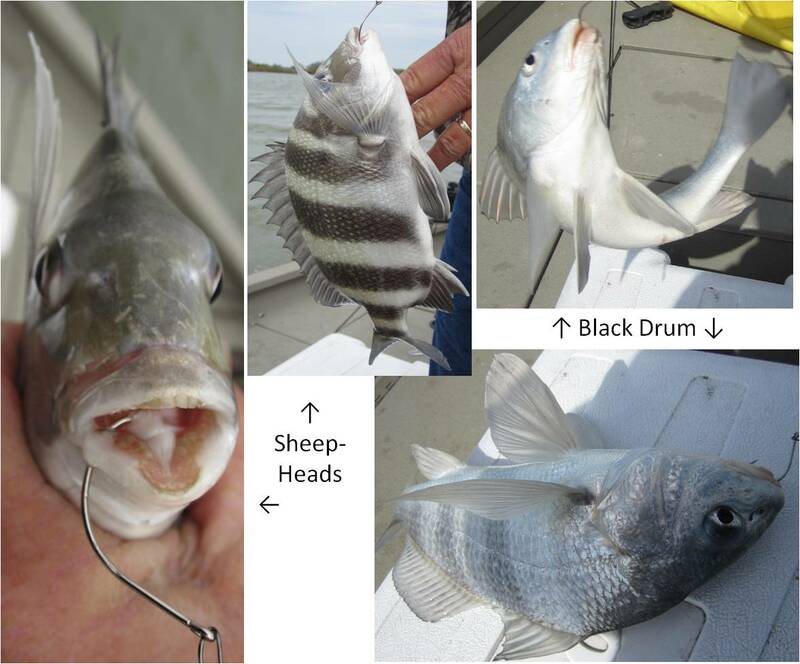 Dad said a lot of people keep both of these fish but he will never keep a sheep-head and will only keep a black drum if it is huge because they usually aren’t worth cleaning for the meat you get off of them. Dad kept making fun of me for taking a million pictures but, hey, I need visual aids for this thing, right? At one point, we were all catching fish pretty steadily. Joseph and I even caught two reds at the same time. Saturday afternoon, we were getting ready to call it quits when Joseph snag himself a Flounder. Flounder are neat because both of their eyes are on the same side of their heads. They lay flat on one side at the ocean floor so there is no need for eyes on the other side of their head. Weird, right? Joseph has caught 2 flounder on previous trips that were half an inch too short so we were dying for this one to be 14″ this time! He was in luck because it was a hair over the legal limit! We fished a little longer then headed in to play some washers with Herbert and watch the Aggie vs. Auburn game at the motel. (The motel even had ESPNU on their cable and WiFi so it couldn’t be all that bad!) We ate chili for dinner that Dad had been cooking in the crock pot all day to warm us up. The Aggies won 63-21 and we even had our 2nd string QB and defense playing for the 2nd half which was good to give the starters a rest with the hellish two weeks ahead when we are away for Mississippi State and Alabama back to back. Anyways, after the game we relaxed then called it a night to wake up early for some more fishing! Sunday morning was a little colder but the wind was down to 12mph rather than 15 which I thought made a pretty big difference, especially since I had been so wind-burned from Saturday that my face looked like a big tomato (minus my forehead which was covered by thick headband ear-warmers). We started off at a different spot to fish and within 5 minutes, I caught a baby red. Joseph on the other hand had his mouth in the right position because he caught a pretty big drum. So big that Dad was even willing to keep it! After drifting for a little while, we went back over to the spot where we (and by we I mean Joseph) caught a bunch of fish to try that hole again. The boat ride from drifting to that spot was probably the roughest, bumpiest ride ever. I swear I have whip-lash! I was flailing all over the place like a rag doll because I couldn’t hold on to anything other than the things I was trying to keep from flying out of the boat. The whole time I was playing the Chitty Chitty Bang Bang scene from Ace Ventura in my head. We finally get to the other spot and I don’t even get a bite while Dad catches a small trout and Mom catches a small red fish. Joseph gets a nice bite and gets excited. As he is reeling it in, we are all trying to figure out what it is because it never showed itself above water. 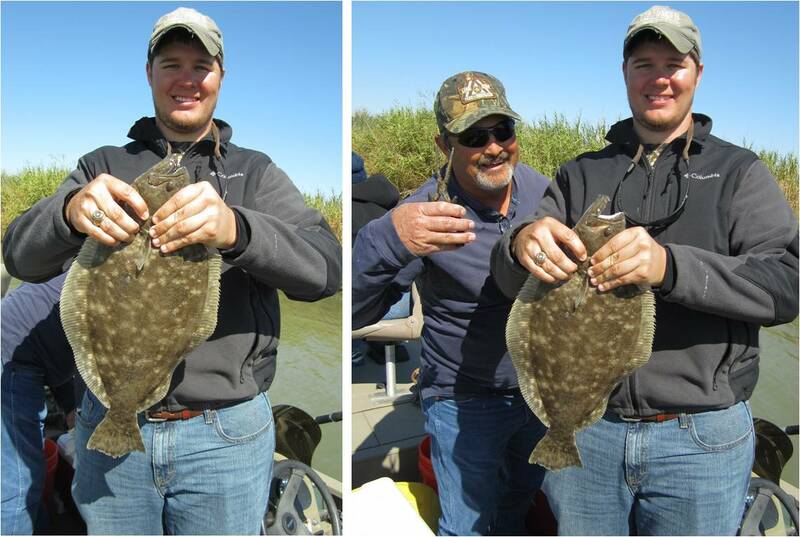 When he brings it close to the boat we notice it is a huge flounder! 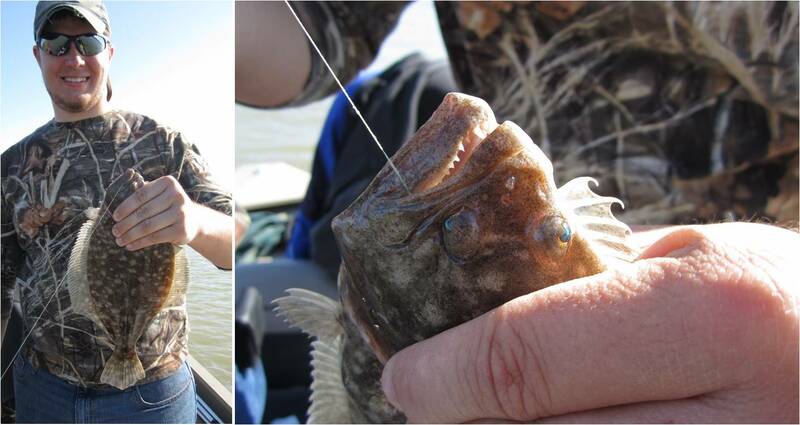 The flounder was 20″ and was the biggest one I have seen so far! As you can tell from the picture above, Dad was pretty excited again! At least someone was filling up our fish cooler! When they were cleaning the fish there were about 20 pelicans hanging out waiting to be thrown some of the guts. Gross, but they are neat birds. Overall, we had a blast! 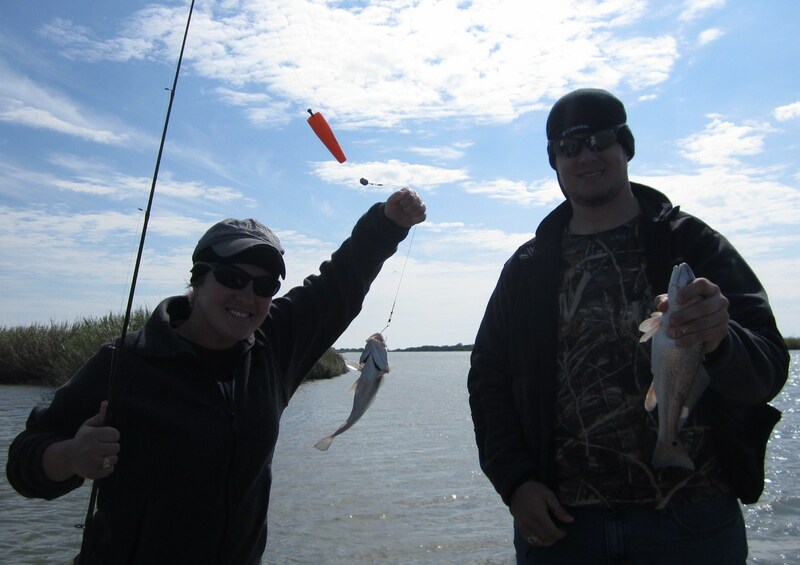 Even though I didn’t catch any keepers I still had a lot of fun because Joseph finally caught his keeper red fish and the biggest flounder I have ever seen in person! 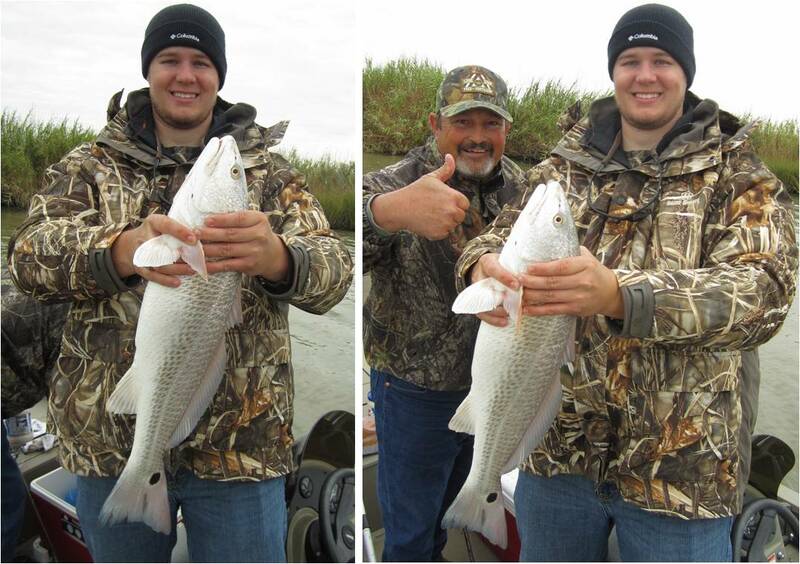 It’s fun seeing him have so much fun and it’s about time he out-fished my family! I guess we have turned him into a fisherman after-all! 🙂 I can’t wait to make some stuffed flounder from his catch! Hopefully we will be able to go again soon but I think we may have to wait until the Spring to go back down to Seadrift. I will be counting down the days!